OK, I suppose I have got to do this. I have to write a report on a game that I was so angry about in the end. Saints had a gilt edged chance to progress into the knockout stages of the Europa League, but without exaggerating in any way, they completely and comprehensively stuffed it up. 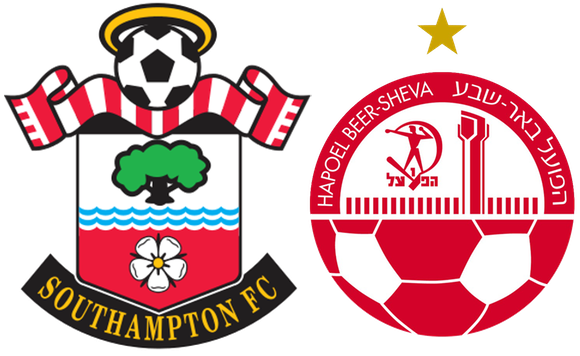 Goal difference does not come into consideration in the Europa League, but head to head results do and as the game in Israel was goalless, all that Saints needed to do was win, or get a goalless draw to go through. A score draw, or a win was what Hapoel Be’er Sheva needed. The longer the game went on goalless, the more you just knew what was going to happen and in the 78th minute, with Hapoel Be’er Sheva's very first shot on target, Buzaglo managed to put the ball beyond Forster, to go 0-1 up. So, with 12 minutes left of normal time, Saints now had to score two goals, when they had looked unlikely to even score one. Part of the reason for that was the one forward that seems capable of actually scoring goals at the minute, had gone off injured in the 39th minute. Charlie Austin went into a challenge and ended up on the ground in obvious pain and holding his right shoulder. So, the obvious thing to do was to get the ball in the box and the CB's would do the business. To be quite honest they damn near did. Virgil van Dyke did his impersonation of a one man team, by rousing the other players and diving into the penalty box at every opportunity. Eventually his persistence paid off and he forced the ball home in the first minute of injury time. Cue the crowd going wild. Shortly after, the ball was delivered into the penalty area and Maya Yoshida rose with the grace of a swan ...... and headed the ball wide. It would have been a famous victory, but as it was it was a draw, that meant exit from the Europa League. Look at the stats, Saints had 15 shots and 5 on target for just the one goal. Hapoel Be’er Sheva had eight shots, with just the one on target. Sometimes you just wonder at Saints defence. The whole team defended as one for the entire match against Liverpool and yet they managed to look uncomfortable against the Israelis. Funny old world. Forster : is turning into a bit of an enigma with me. A great keeper, who seems to be having moments of indecision recently. That god-awful clanger at Crystal Palace seems to have affected him. He never dominated his area at the best of times, but he did seem to have moments of mini-panic. Cédric : seemed to be our only offensive outlet at times. A quality player, who seemed bemused by his teammates lack of drive. Yoshida : although nowhere near his erratic form of the past, he just didn't quite seem at the races, although if his final seconds header had actually been on target, then he would be a legend now. Van Dijk : almost above criticism these days, other than he tries to be defence, midfield and forward. His single minded refusal to give up, fashioned a goal in injury time and showed (once again) the forwards how to do it. Bertrand : another 'not quite there', as he has been in several games this season. Far too classy to be like this for long. Trouble is that McQueen is breathing down his neck now. Højbjerg : will be great for us when he has more experience of the Premier League, seems to have bags of skill and vision. Still tends to get caught out in games like this against opposition he really ought to be dominating. Romeu : by far our most effective midfielder, he just looked tired to me. Davis : A favourite of mine for some time, he just didn't seem to have the impact that he used to have. I am not sure if that is because of Puel's system, but we do miss him when he is not playing. Sims : Boy Wonder didn't have the impact that he did before. Funnily enough I think it was more because of the underperforming all around him, than things he was doing wrong. Still, one for the future. He will have learned from this. Redmond : I know that he is having a difficult time getting to grips with what Puel wants of him, but he can hardly have been helped by the vitriolic abuse that he got from some sections of the crowd. Shameful and things like this make me embarrassed to be a Saints fan. Long : Ran about. Lots. Tadić : Made his appearance with his Carbon Fibre face mask. Looked understandably nervous of contact, but was able to use his experience to at least get the Saints offence going. Ward-Prowse : My opinion of him swings from one extreme to the other. This was one of those waste of time games. This annoyed me almost more than last years pathetic capitulation to the mighty Midtjylland. Saints looked a better team than all three of the others in Group K and yet is was to be Saints and Inter Milan that failed to progress. The overriding feeling was of anger that a really good chance to progress to the knock-out stages, had been chucked away, just through lack of effort at crucial moments. Goodness knows when we will get the chance of European football again.